Read this all as at the end we’ll share how you can help to solve the 2 major problems faced with suppliers as outlined by more than 70% of answers. Plus we’ll be offering a Free Sample “Welcome Booklet for Suppliers” – 75% of respondents did not have this. Why do we have these 2 major problems with suppliers? The survey received close to 500 responses (498 to be exact). 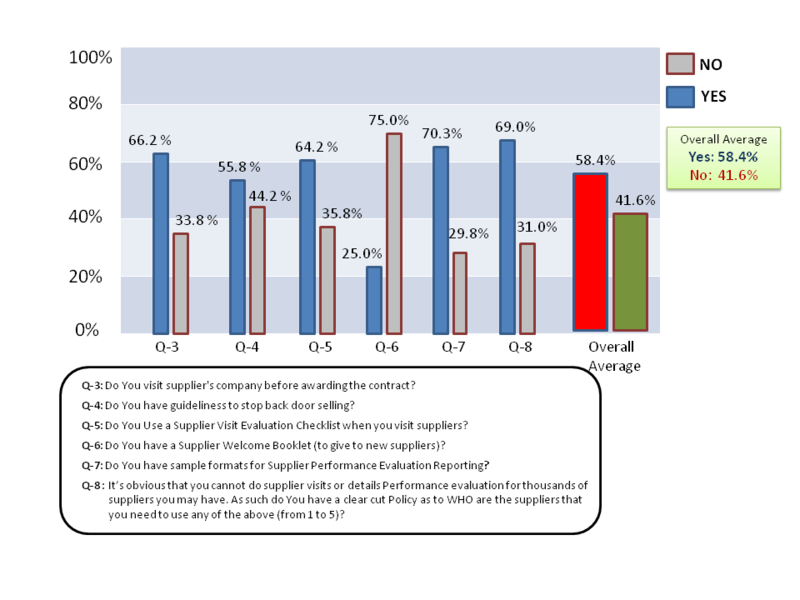 This was truly a multi-national survey as procurement & supplier managers from all over the world participated responded i.e. Africa, Middle East, Asia, Europe, North & South America. (Click here to see all the countries that participated). 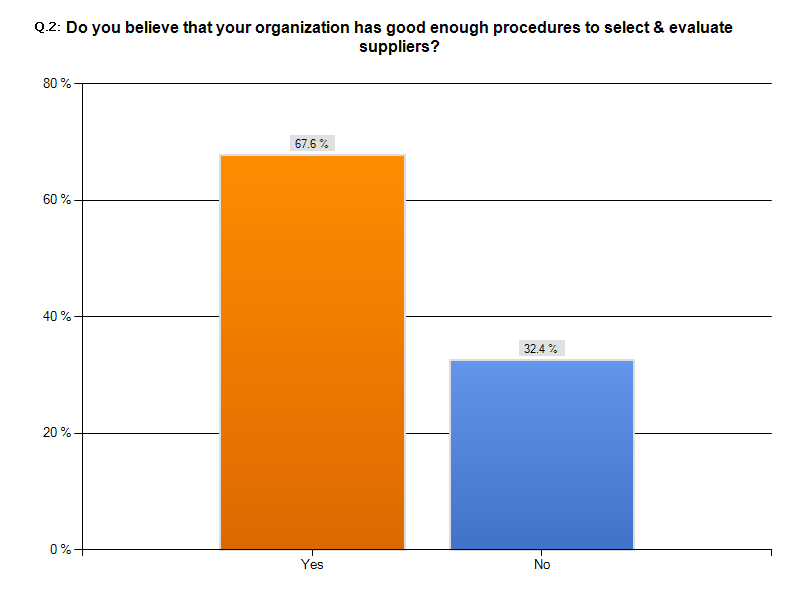 Overall majority of people (67.6%) that responded believe that they have good enough procedures to select & evaluate suppliers (Q2). Questions 3 to 8 were of the same nature i.e. simply outlining some processes that should be in place for a good supplier selection & performance evaluation. That’s why you’ll see at the end of Chart 2 an overall average. To summarize the ‘Yes/No’ answers, it seems that majority of respondents that answered have proper processes in place and also have indicated the proper processes that they actually have in place from Q3 to Q8. However one thing that seems to be missing is a Welcome Supplier Booklet. That’s why are giving a sample of a Welcome Supplier Booklet. Why are we having these problems, even though we have proper processes in place? The processes are not executed correctly i.e. you can have all the best processes in place but if people do not follow them, there are going to be problems. The processes in places are the wrong processes, so no matter how well they are executed they are not going to make a difference. Now why do delays & quality problems arise!? The wrong supplier was selected. The client is partially responsible for such delays & quality problems. Before you stop reading, THINK about both! Both these answers have one thing in common: The responsibility rests with the procurement/supplier manager or client, rather than assigning blame on the supplier. The only way to solve any problems is to take responsibility and think of ways to solve them. And you can’t do them if you just point the blame to others. “Have not chosen the right supplier to deliver the correct request of end user”. If the wrong supplier was selected whose responsibility was it? Of course clients responsibility! (Truth be told, there are times when a different team or person may have been responsible for selection and another one for fulfillment & delivery. And we gather that you’re the latte. But that is an internal issue to be resolved). “It is not about the suppliers’ performance that keeps me awake, but our user requests marked as urgent”. So when your end users demand things urgently then suppliers will not be able to fulfill such requests. This of course does not imply that there are cases when suppliers are solely responsible for the delay & quality issues. First of all fill in the form on the right to get the Free Supplier Welcome Booklet. Plus after the booklet you will be getting the Special report “Solving Once & For All the 2 Biggest Problems with Suppliers & Contractors: Delivery Delays & Quality Problems!” that will show you best practices on how to manage and avoid delay and quality problems (our research team is still analyzing best practices and will come up within one week or so with the Special Report. What did you do to manage delay & quality issues that worked? What did you do to manage delay & quality issues that did NOT work? The joint wisdom will surely provide some practicable methods to manage and avoid delay & quality problems.